Stinger Batteries are made to power car audio systems. 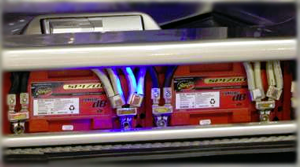 If you are powering a large car audio system, you may need to get a second battery for your car audio system. In order to run two batteries you will also need a battery isolator. We also have stinger power supplies, custom battery posts, and battery chargers. We stock everything you need to upgrade your car's power system.